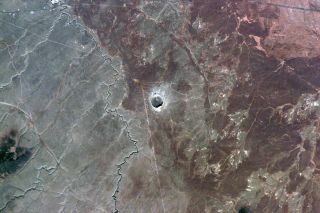 Barringer Impact Crater in Arizona – also known as Meteor Crater – is captured in this image taken in 1995 by space shuttle astronauts. The Barringer meteorite crater — known popularly as "Meteor Crater" — near Winslow, Ariz., was formed some 50,000 years ago in the flat-lying sedimentary rocks of the Southern Colorado Plateau in Arizona. Now, scientists are using the crater to study mysteries near and far. Meteor Crater serves as a "teachable moment" in geological time. Shown here are graduate students taking part in a 2011 field training program at the crater. Students are introduced to impact cratering processes. Skills developed during field camp are designed to prepare students for their own thesis studies in impact cratered terrains, be it on the Earth, the Moon, Mars, or some other solar system planetary surface. Field mobility test at Meteor Crater of a terrestrial precursor of a Lunar Surface Explorer – a mobile science platform that can be deployed and operate anywhere on the lunar surface. It would work both as an independent rover and as an assistant to astronauts. Meteor Crater in Arizona (formally called Barringer meteorite crater) viewed from the rim near the visitor center. The crater is nearly a mile across and the hole more than 550 feet deep.